We grew up boiling on the bayou! Get our famous Louisiana crawfish hot from the pot 11am-7pm every day. Fishing has been a unique way of life for people here on the Gulf Coast for generations. As the Gulf Coast’s grocer, and avid fishers ourselves, we feel a particular commitment to preserve and protect our seafood industry, which plays such an important role in our culture and economy. Our search for the best begins right here at home. Most of our seafood comes from local fishermen with whom we have close personal and professional relationships. We’re also a proud partner of the Coastal Conservation Association (CCA), whose mission is to conserve and protect our coast and waterways. Our wild-caught seafood – like Alaska salmon and Louisiana shrimp – is caught in natural habitats such as oceans, gulfs, lakes, bays, rivers and basins. 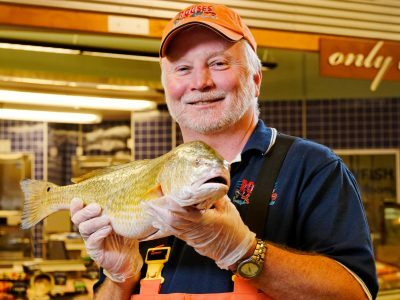 Several fish and shellfish species thrive in an acqua farm setting, including Mississippi catfish and Alabama oysters. We work with trusted fish farmers that use the best acquaculture practices. Seafood, like produce, has seasons. We source in-season from the East Coast and West Coast, and from countries around the world. Fresh fish is caught and delivered jet fresh to our stores. Thanks to modern freezing methods, you can enjoy seasonal favorites like wild-caught Alaska salmon year-round. Get the health benefits of fresh or frozen and the budget benefits of packaged by choosing responsibly sourced canned or jarred. Our certified seafood experts are trained to select, cut and prepare every piece of seafood we sell. They are always available to prep your seafood or offer cooking or recipe ideas.